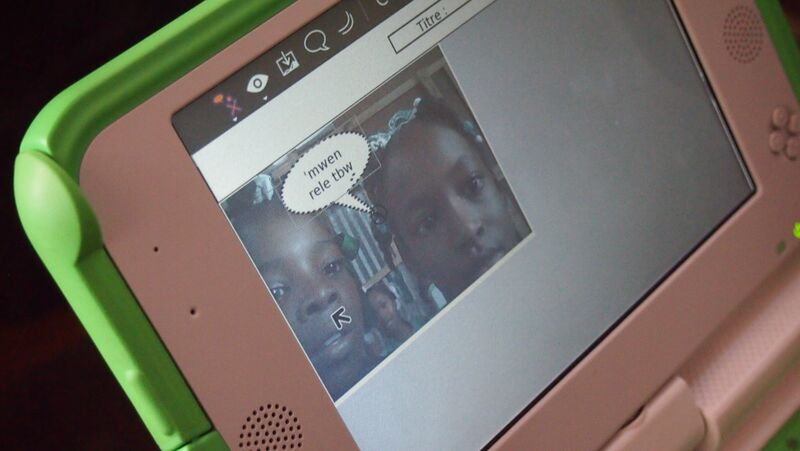 3rd grade girls captioning their photo. 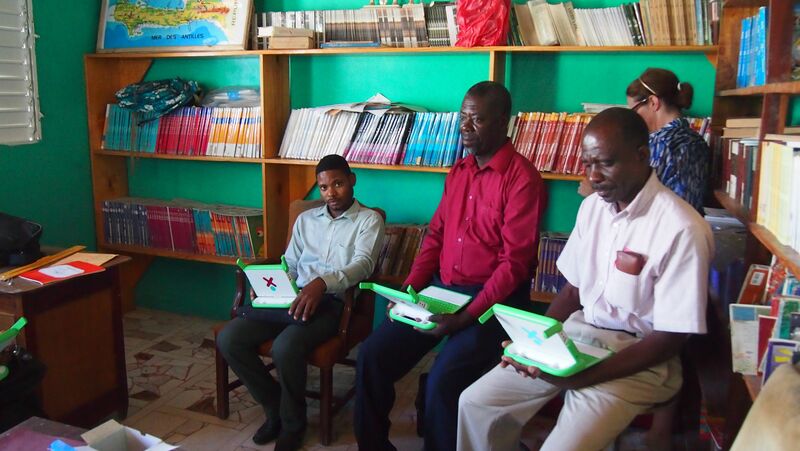 We began with our pilot introduction of 13 old OLPC machines that one of our team members upgraded to the new system. The laptops were enthusiastically received by both the students and their teachers. The young 3rd graders met, if not exceeded, the performance level of their counterparts in Carmel, California. There, team member Jim Hamilton challenged 3rd graders to figure out on their own how to open the machines, turn them on, and get into an application. Within minutes, the students were gaming mazes, taking video, drawing pictures, and finding their friends. St. André’s teachers seeing the laptops for the first time. The Haitian students quickly demonstrated that they, like the students in Carmel, are already outpacing their teachers when it comes to technology. Therefore our initial focus will be on teacher training for integrating the laptops into the learning curriculum. Working with the Monterey Institute of International Studies (MIIS), the Partnership is also introducing an English language program in the primary grades 3-6, as well as a One Laptop Per Child program. The Partnership has long donated desktop and laptop computers to the school, but with students from MIIS as part of the team, the English and laptop programs will now have a formalized curriculum. The OLPC laptop program in particular will be a most tangible and powerful change at the school. The MIIS students are developing an English language/computer skills curriculum for 3rd-6th grades. With the Partnership donating more Windows and Linux laptops and supporting the creation of a new Resource Center/Computer Lab at the school, St. André’s students have the chance to develop language and computer skills that will make them more competitive in the extremely impoverished employment market in Haiti. 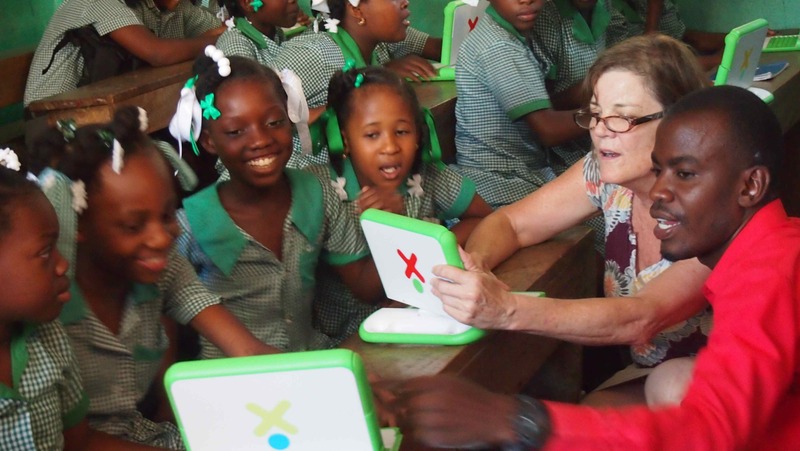 EFL Haiti team advisor introducing the OLPC machines to 5th grade students and Evens, an English teacher at the school.